I'm still enjoying time with my family and squeezing the last few moments out of our Christmas break, so I've enlisted the help – again – from our fabulous Mary, FCF team member, to help me with the last of our post series about getting and staying healthy, brought to you by CVS and their #FindYourHealthy campaign! We've been fighting some germs and sickness at our house – and so far we have won! 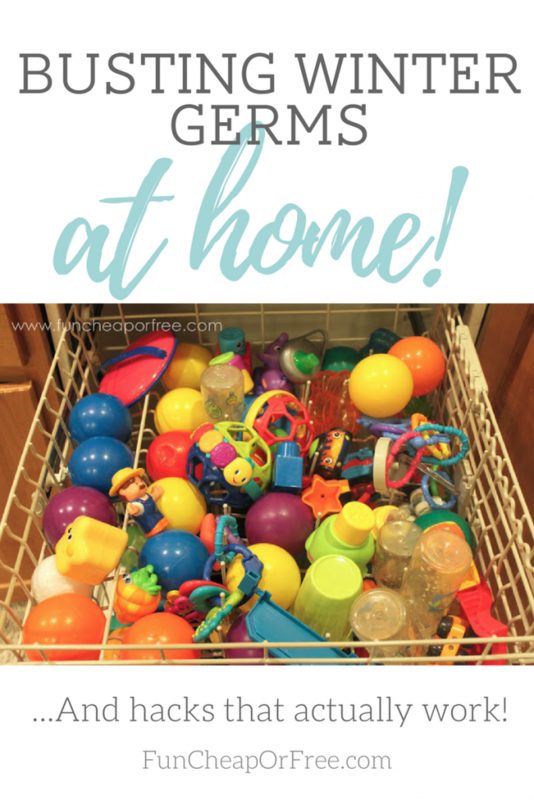 So it inspired this post where Mary shares how she is fighting germs in her own house! These hacks really work and I hope they help keep your home sniffle-free this winter. Take it away, Mary! Today I’m sharing my top 3 ways for busting those winter germs at home! Washing your hands is the top recommendation from doctors during cold and flu season and you know what? It really works! Our hands are constantly touching shared surfaces like door knobs, light switches, table tops, etc. and germs can live on those surfaces long after they’ve been left there. The key to hand-washing is to use warm water and wash your hands with soap for 20-30 seconds. I have taught my kids to sing the “Happy Birthday” song in their heads while washing so they get in the habit of getting a good scrub in. I love soaps that smell good and have aloe for keeping hands soft, like this one. If you’re on the go a lot you might not be able to find a place to wash up so keep a hand sanitizer in your purse or car so you’re always prepared. 2. Disinfect Surfaces Around Your Home…ESPECIALLY the ones you might not think of! Disinfecting surfaces isn’t just good for colds and flus, it helps keep things clean from other bacteria like salmonella and Ecoli. It’s always a good idea to wipe down the kitchen counter and table before cooking or serving dinner, as well as cleaning up afterwards. I like to use a simple disinfecting wipe like this one to get the job done. I also keep one of these containers in each bathroom cupboard for quick and easy clean up. Another shared surface where germs lurk is toys! 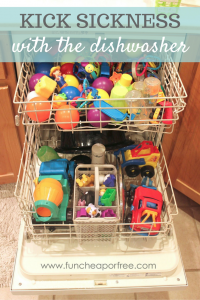 My best tip for disinfecting toys is to put them in the dishwasher. Don't just focus on the obvious surfaces, and it will help keep germs at bay all season long! One of the biggest hurdles to staying healthy is that those who are sick are often contagious up to 24 hours before symptoms begin! You know the drill…your child’s friend comes over for a playdate one afternoon and seems completely fine. Then you get the dreaded phone call the next morning that they were throwing up all night and cross your fingers your child doesn’t get it. One of the best ways to combat these “secret germs” is to not share anything that your mouth touches. We’re talking cups, forks, spoons, chapstick, etc. If someone in your home is already sick you can use plastic cups (be sure to write your names on them! ), and have them dry their hands using paper towels or their own separate hand towel. Additionally, be sure to wash your towels and linens frequently, and keep a box of tissues handy so your kids aren't tempted to use their hands. Gross. I hope these tips help you fight those winter germs and keep your home happy and healthy! Do you have any good germ busting tips? Leave them in the comments below…and stay healthy this winter! And thanks to CVS for making this post series possible. It's brands like this that make it possible for me to blog and give information free for the taking. So I encourage you to support them back and keep their #FindYourHealthy campaign in mind! Have a fabulous rest of 2016! Thanks to CVS for generously making this post possible! All opinions and the entire basis of the post was our idea, of course. Very helpful tips Jordan! We don’t experience winter here from where I live but these tips are surely a great help. Seriously love this hack! Germs are getting so bad this year. Thank you! Using these TODAY!! !